Update: it has been almost 5 years since I began this test to determine which pens are fade proof. I have since updated the photographs and the text. The only change is the sharpie has faded more since 2013 and I added a few more pens at the bottom of the test sample. 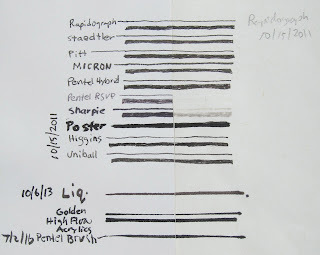 My experiment to determine which drawing pens are fade proof has been going on for almost 5 years now. The goal of the experiment was to determine which inks resist fading when exposed to UV light. I also thought I should test a few of the pens that are used by artists that aren't marketed as drawing pens, such as Sharpies and ballpoint pens. I needed to find a place to store the paper where it would be exposed to sunlight for the entire day. At first I thought I could just tape it to a window inside of my house but some windows block the UV light, which would defeat the purpose of this test. I decided to use the interior of my car is a test chamber where it would also be exposed to extreme changes in temperature and humidity. Most collectors and artists exhibit their artwork indoors where the light is less intense, but the concept is that exposing the ink to intense UV light will mimic the long term effects of exposure to lower levels of UV light. 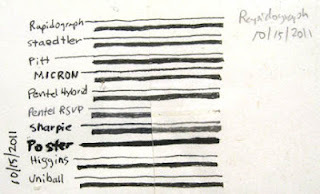 With each pen, I drew lines on a piece of paper, and labeled it. When I was done I cut the sheet of paper in half. I stored one half of it inside my car and the other half in complete darkness. I photographed the results in 2013 and in 2016, see the photos below. Pen fade proof test after approximately 5 years. the right half was exposed to direct sun each day. The photo was taken on 7/2/2016. 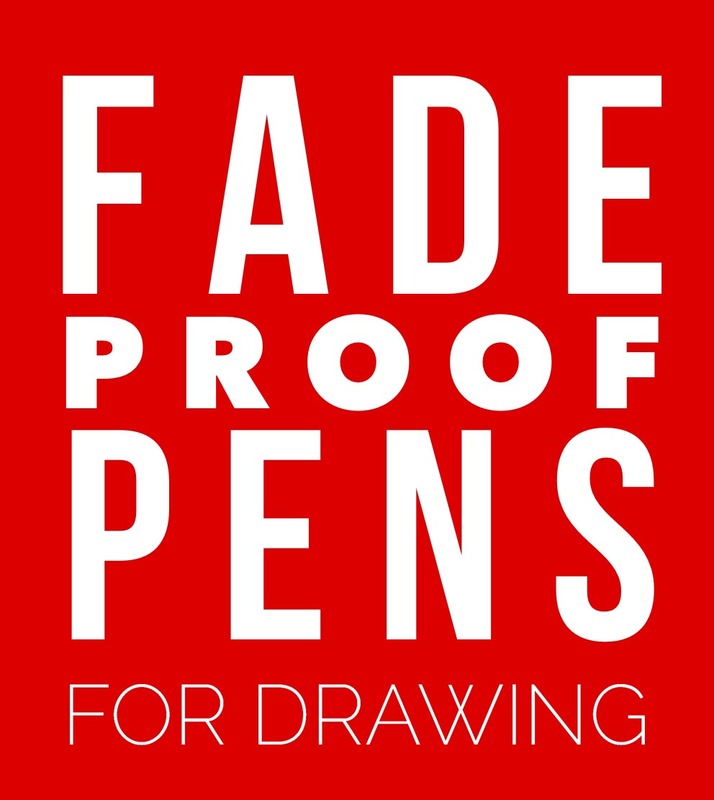 Only two pens showed any signs of fading, and they neither of them are advertised as drawing pens but are commonly used by artists. The Sharpie is marketed as being permanent but I think that they mean that it's not easily erased or removed. They never claim that it is lightfast (fade proof). The water-based poster pen made by Sharpie hasn't faded. I prefer the water-based Sharpie poster pens over regular Sharpies because they're odor free. Artists who use regular ballpoint pens for drawing should note that the Pentel RSVP ballpoint pen has almost completely faded. 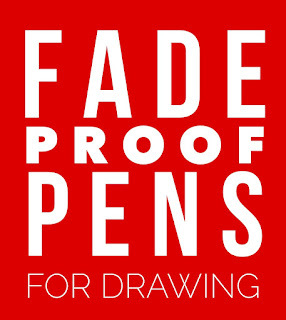 This is just a standard ballpoint pen and Pentel doesn't claim that they are fade proof. Notice that the Pentel Hybrid Technica, which is a ballpoint drawing pen, has stood up remarkably well. They also claim that it's water-resistant but I have found the the ink bleeds a little when I add washes of watercolor or ink over it. Some artists use this to their advantage by using it to add some light tones to the drawing just by brushing water over it. What I like about this pen is that the ballpoint doesn't wear out like a felt tipped pen, and the clear barrel makes it easy to determine how much ink is left. I contacted Uni-Ball and inquired about which of their pens would be best for drawing and they recommend using the pens that contain Super-Ink, but they also conceded that they haven't done extensive testing on how many years the ink would hold up. My test doesn't show any signs of fading after five years. 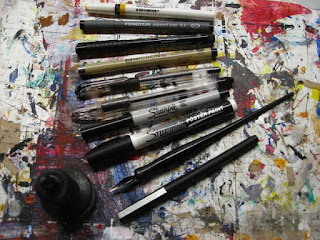 Felt tip pens are convenient and popular among artists and illustrators. Micron pens, made by Sakura, seem to be the most popular. The marketing material for Micron pens claims that they have been developing their inks for over 25 years and they market direct towards artists and illustrators. The conclusion is that UV light can be extremely damaging to artwork and that artwork shouldn't be displayed in direct sunlight. 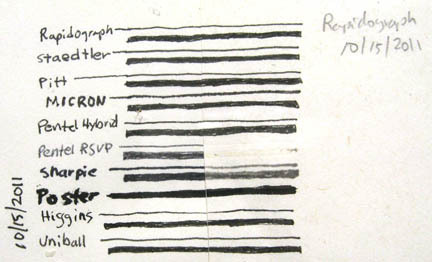 The choice of art materials has a dramatic effect upon fade resistance. If you're interested, Golden Paints article on how to test for lightfastness. Writing inside of notebook is less prone to fading because it's protected from light by storing it closed flat. 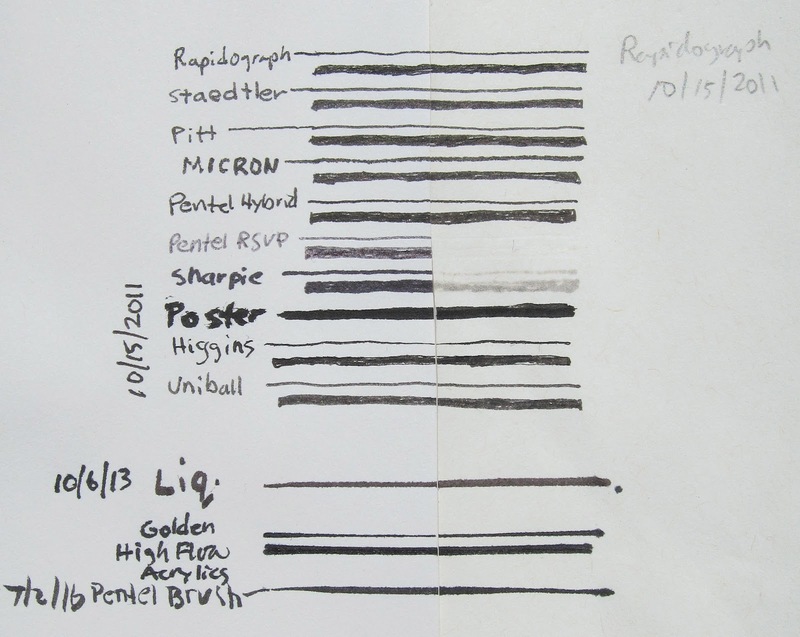 However, if you're a researcher or a writer who wants your work to last over the years you may want to switch to a pen that uses ink that is fade resistant. This is exactly what I wanted when looking up information about pens and their respective fade properties. Very helpful, thank you! You're welcome.I'm glad you found it useful!